Greenbee Parking, a fast growing airport parking solutions company, has just announced cheap New Orleans airport parking rates for frequent fliers using the busy New Orleans (MSY) airport. The new rates are yet another strategic offer from the dynamic young company to capture more market share and at the same time offer their customers an easy and comfortable parking option in between their hectic travel schedules. "We want traveler experience in New Orleans to be fabulous in every way." Greenbee Parking, one of the youngest and fastest growing airport parking solutions firm in the nation, has just announced mega savings options with cheap New Orleans airport parking rates for travelers using the busy New Orleans (MSY) airport regularly. Popularly known as the Big Easy, New Orleans is one of the most fascinating cities of the world and a great tourist attraction. It falls under the top ‘must visit’ places in the US which means it as much of a target for domestic tourists as it is with international visitors to the country. Needless to say this puts quite a bit of pressure on air and ground traffic which is reflected, among other things, in the busy airport parking scenario. In the past, reviews on the city has seen visitors gushing over the incredible experiences that they have been through and at the same time quite vilifying the authorities for the parking hassles they faced at MSY. Now with service providers like Greenbee Parking and their great new offers things are definitely looking up. 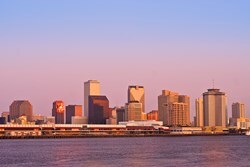 New Orleans is considered to be one of the most fascinating cities of the world. Like an old mistress, it continues to lure in the young and old from all corners of the world to come and experience its unforgettable music and lip-smacking cuisine. The unique New Orleans culture is an amalgamation of influences from Europe, particularly France, deep recesses of Africa and the fascinating Caribbean’s. There is as much to experience in its ancient architecture, old haunted houses, Cajun spices, voodoo and black magic shops as there is in the amazing lush nature all around it. The city is catered to by the MSY Airport which is the 2nd lowest-lying airport in the world, next to Amsterdam's Schiphol International Airport. Despite the devastation left behind by Hurricane Katrina, New Orleans sees a lot of business travel along with its heavy tourist footfalls. While airport parking space has been at a premium, rising rates without improved infrastructure had frequent fliers constantly complaining about the amenities here. Now with the cheap New Orleans airport parking rates from Greenbee Parking they will have the option to get secure parking spots for their vehicles, even with last minutes bookings and that too at very affordable rates. Greenbeeparking.com is the connection between consumers and parking vacancies in close proximity to major airports and seaports. The parking spaces are very affordable because the company has negotiated discounted rates with major hotel chains for the parking spaces that are not currently occupied. Here's how it works. Greenbee Parking puts the available inventory of parking spaces on their website to be reserved by business and leisure travelers looking for cheap airport parking. This alternative method for finding parking equates to significant savings for the traveler. Greenbee Parking is the nation's most innovative long term parking company, with a new way of making long term parking affordable. The company is rapidly adding new airports to its network.